Мария Д. Лойзоу, Музыкальная библиотека в ХХI веке, Библиотека "Измайловская", Санкт-Петербург, 21 мая, 2014, 12:00. BOSTON, MA, USA – The Educational Bridge Project’s twenty-fifth Russian-American festival opens on Wednesday, May 14th, and runs through Sunday, May 24th, in Moscow and St. Petersburg. This marks the 25th time the Educational Bridge Project brings together Russians and Americans for a series of performances, lectures, and other cultural events. The festival’s schedule, comprised of more than twenty events, will be presented as a collaboration of Russian and American educators and artists from various universities, conservatories, museums, community centers, and libraries. Many of the festival participants have already performed with each other in past festivals, either in Boston or St. Petersburg/Moscow, sharing the stages and auditoriums in collaborative concerts, seminars, presentations, and discussions. 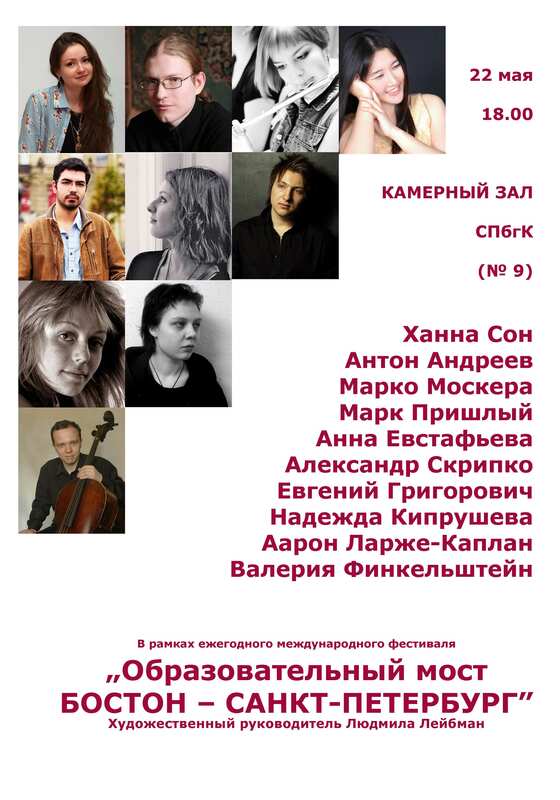 5/15, Georges Devdariani, Russian actor and musician, will speak to Russian students studying English drama on "the skill of clear and expressive speech" (Flyer-PDF) and later in the festival join two musicians and two authors in an evening of dramatic readings and music (5/16). 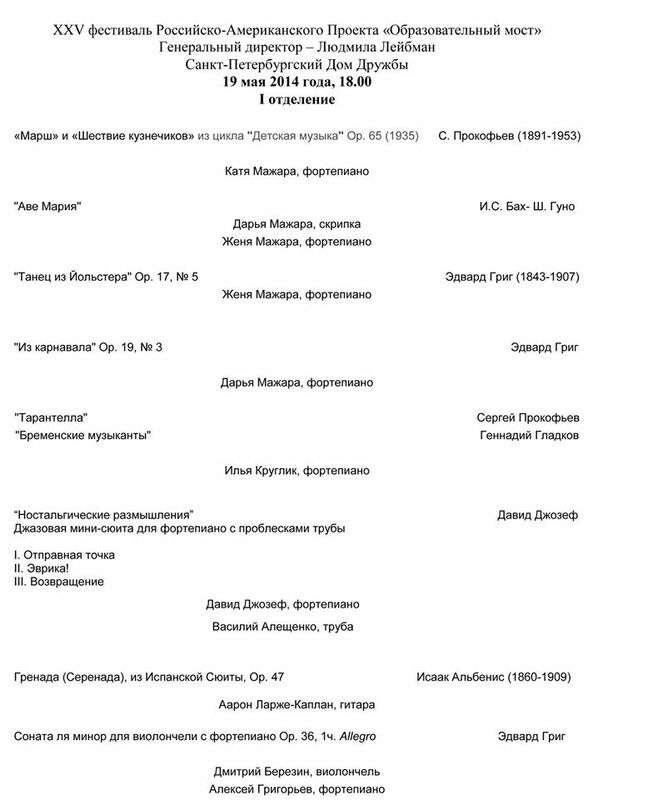 5/18, "Tribute to the Unforgetable Igor Uryash" - Five years ago in Boston the Educational Bridge Project presented highly acclaimed concerts by the brilliant Russian pianist Igor Uryash who tragically died this year at the age of 48. He made such a hit with Boston audiences that we honor his memory by presenting a program with another EBP past festivals’ participant, Alexey Grigoryev, playing Igor's signature piece, "Pictures at an Exhibition." 5/20, "Dialogues of Culture" will be a roundtable discussion by 10 Americans and 10 Russians led by Tatyana Kholostova, Professor at Baltic State Technical University, who has been organizing these discussions for the last four years, as well as participating in our Boston festivals.